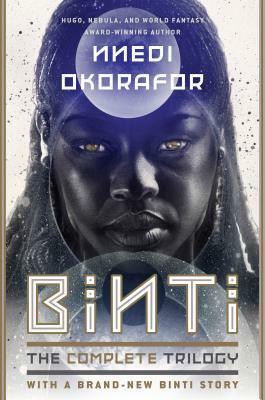 Binti only wants one thing: to further her search for knowledge by attending the prestigious Oomza University, an off-planet school who’s offered her the first invitation ever extended to a person of her people, the Himba. During her journey to Oomza U, however, her ship is attacked by a group called the Meduse. An unexpected friendship forms with one of the jellyfish-like creatures named Okwu, and it opens Binti’s eyes to a whole world of conflict and brewing war that only she has the hope of stopping. They say that when faced with a fight you cannot win, you can never predict what you will do next. But I’d always known I’d fight until I was killed. I’ve been meaning to pick up these novellas for ages, so I was really excited to get the opportunity to review the entire trilogy now that it’s been released in a bind-up. This is a series that starts off really strong—enough so that I’d say the first book, Binti, is one of the most enjoyable novellas I’ve ever read, as well as one of my favorite adult sci-fi reads ever. While the first novella lacks a bit in world-building, it more than makes up for that absence with character development. I loved Binti as a character and really treasured her thirst for knowledge and her bravery despite all of the immense obstacles trying to hold her back from her future. Okwu, on the other hand, I had mixed feelings about at first, but quickly came to treasure as a character despite the rocky nature of their meeting. The thing about this series is that it can almost be hard to know who you want to root for, because everyone is flawed and history is muddled—which I found incredibly true-to-life for many circumstances, especially considering histories of wars and feds, so I appreciated that there were no “perfect” groups or characters in the equation. Unfortunately, I’ll admit that the series did become less enjoyable for me as time went on. The second novella, Home, was still a very fun read, but it became tougher for me to reason with the lack of world-building and the random info dumps; on the other hand, though, The Night Masquerade went too far in the opposite direction and gave me too much information and history with too little action and character development. Even back then I had changed things, and I didn’t even know it. When I should have reveled in this gift, instead, I’d seen myself as broken. But couldn’t you be broken and still bring change? Minor complaints aside, I wholeheartedly recommend this series. It’s an incredibly quick trilogy to get through, there’s a gorgeous portrayal of culture and how significant cultural history and rituals can be to people—especially to individuals who have a history of being oppressed, like Binti’s people, the Himba—and, if you’re a fan of audiobooks, I strongly recommend Robin Miles’ delivery of these stories. I read the first novella in January and really loved it! I actually listened to the audiobook, which was fantastic. I’m looking forward to continuing the series. I’ll take your review as a warning for the world-building part. It’s good that I’ll be aware of the lack of it in the second one, and the overwhelming amount in the third one. Great review!